When we begin our search for our family history we mostly start with the internet. Although I personally do not advise using the world wide web as the FIRST step in genealogical search there have been many people who barely had to do anything anymore in terms of family history research as their family had already been researched by someone else. This usually happens also to many of my clients whose ancestors are from Argao; within a week or two they would already be presented with a complete genealogy of their family and thus they no longer have to go through all the difficulty of searching for old records themselves. As the 2013 election season begins in earnest I cannot help but think back to 2004 when the late King of Cinema, Fernando Poe, Jr., was almost disqualified from running for the presidency due to a "dubious" citizenship and how easy it would have been to establish his family tree using the internet at that time. It all started on January 9, 2004 when Victorino Fornier filed a case with the Commission on Elections asking the body to disqualify FPJ on the ground that he was not a Filipino citizen. Although the Philippine Supreme Court eventually ruled in Fernando Poe, Jr.'s favor in March of the same year, there were several key materials that a genealogist would have been able to help FPJ's camp with if only they had consulted a family historian. One record that was not presented was the marriage record of Bessie Kelley Poe's parents, Auther E. Kelley and Marta Gatbonton. This single record would have added more weight to Poe's defense of his citizenship because here was a clear record of the Pampango roots of FPJ. Marta Gatbonton, FPJ's maternal grandmother, was a pure Filipina born in Candaba, Pampanga, and a quick search using the LDS's FamilySearch website would have shown those who questioned Poe's citizenship all the Filipino line they needed through the Gatbonton side of the family. And if they wanted more, one of the evidenciary materials FPJ's camp showed was a certified copy of Lorenzo Pou's death certificate which is also available online. At any rate, all that is in the past. Despite the question of his citizenship, there is no doubt that FPJ's maternal family, the Kelleys, had a very long and interesting history that goes back as far as the 1640s in County Clare, Ireland. Here, at last, is the story of FPJ's American family. Despite the obvious non-Filipino sound of the surname, the Kelley line of FPJ has been in the Philippines since at least 1910. Thus, for all intents and purposes they were already Filipino. FPJ's grandfather was named A.E. Kelley; his first name has always been in question as some records have listed him as Auther and others as Arthur. His grandson, Mahar Mangahas of the Social Weather Stations (SWS), in an article wrote that it was always Auther and never Arthur, and in a communication with him also emphasized that it was Auther. Another grandchild, a sister of FPJ, also emphasized that their grandfather's real name was Auther, and not Arthur. 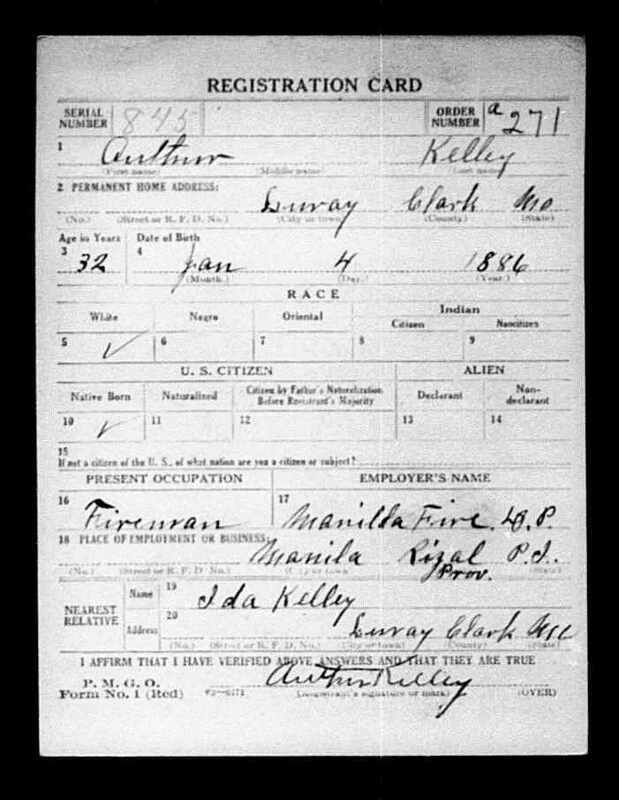 We know that Kelley had been in the Philippines due to the earliest reference that could be found of Auther E. Kelley in the 1910 US Population Census. Here we see Poe's grandfather assigned in the American Military and Naval forces in Camp Keithley located in Dansalan, which is now in Marawi City. The census listed him as single and coming from Missouri. We next see his name in official records in 1918 in his World War I registration card. In this form he is listed as permanently living in Luray, Clark County, Missouri and that his birthday was on January 4, 1886. He was listed also as a fireman and worked in the fire department in Manila. Finally, he listed an "Ida Kelley" as his nearest kin. Aside from these two records I still had barely enough to go on. So, on a hunch, I searched for his name in Philippine records and was surprised to see that his marriage record was already encoded in FamilySearch. And, true to what is already available in some websites, his wife was indeed Marta Gatbonton. The marriage record of Kelley and Marta gives us more information in terms of Poe's family. Here, we have the names of both Kelley's and Gatbonton's parents, although like Kelley, his parents' names are also abbreviated as W.E. Kelley and I.J. Kelley (which was most likely the Ida Kelley in his registration form). Auther Kelley and Marta Gatbonton had several children, one of which was Bessie G. Kelley (though some say her name was Elizabeth, and Bessie clearly is a variant of Elizabeth, the family said that her legal name was Bessie). Bessie was married to Fernando Poe (again, in a communication with the family, they confirmed that Fernando Poe, Sr. had no Allan in his name), who was a famous actor during the early cinema era in the Philippines. 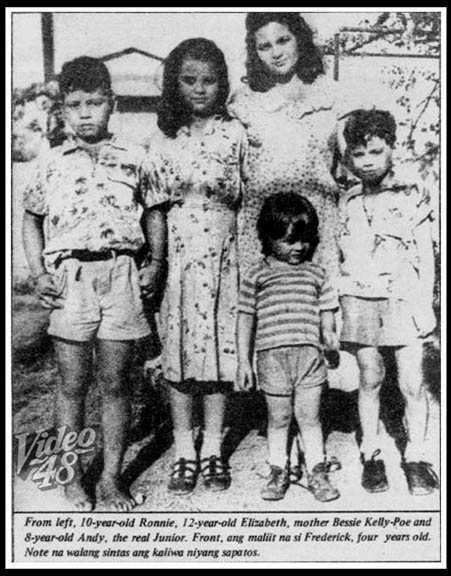 Their children were Elizabeth, Ronald Allan (Ronnie or FPJ), Fernando II (Andy), Genevieve (Jenny), Fredrick (Freddieboy), and Evangeline. I initially thought it would be easier now to trace Auther E. Kelley's roots in the United States as I already had his parents' names, but I was flabbergasted to see scores of Idas in the Missouri and surrounding areas who were married to W. Kelleys. After making the search parameters stricter (W E Kelley with a spouse Ida J. from Missouri) I was rewarded with the only W.E. Kelley who had an Ida J. wife. These were William E. Kelley and Ida J. Kelley, who appeared in the 1910 census with their children. So, we now have the immediate family of Auther E. Kelley. His younger siblings were Jesse J. Kelley, Anna S. Kelley, Maggie A. Kelley, Albin A. Kelley, Ruby M. Kelley, and Fred D. Kelley. 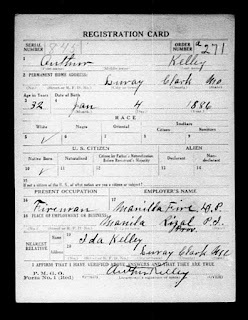 After an hour of using various search strings in FamilySearch I found the marriage record of William E. Kelley and Ida J. Kelley (nee Swisher). And so this led me further to other censuses (1880 and 1850) in the United States, until I hit a dead-end with the grandparents of William and Ida. 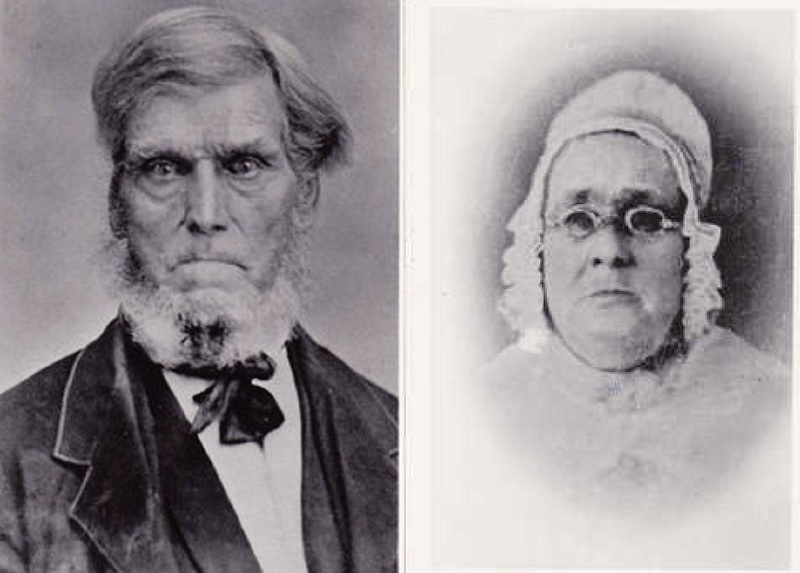 I was also afraid to go further than the generation of this couple's grandparents because although I had fragments of records connecting Poe's grandfather to this couple, there was no clear and direct evidence that Auther E. Kelley was indeed their son. So on another hunch I did several searches online for obituaries of the children of William and Ida Kelley, who would all have died in the years after 1910. Again, this hunch paid off because I was directed to a website called FindAGrave where the burial of one Ida J. Swisher Kelley was listed. Briefly, Find A Grave is a resource for anyone in finding the final disposition of family, friends, and ‘famous' individuals. Its mission is to find, record and present final disposition information from around the world as a virtual cemetery experience. 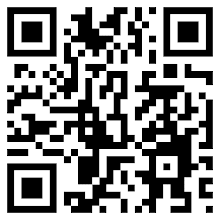 Find A Grave memorials may contain rich content including pictures, biographies and more specific information. Members can leave remembrances via ‘virtual flowers' on the memorials they visit, completing the virtual cemetery experience. Thus, this website is actually a goldmine for genealogy enthusiasts. While not everyone is lucky enough to find their relatives here, the growing popularity of the site makes it possible for more data to be added every day. In this Ida Kelley's Find A Grave memorial it was mentioned that she was the widow of William Emery Kelley (W.E. Kelley!) and the surviving children mentioned were similar to the list of children in the 1910 census. And, best of all, one of the mentioned children was an Arthur E. listed as living in Manila, Philippines. There was no longer any doubt that this was indeed the family of Fernando Poe, Jr.
After this, the family tree just began to unravel by itself. I clicked on the memorial of Poe's great-grandfather, William E. Kelley, which then led me to the name of his parents, William G, Kelley and Anna E. Lollar. The site for William G. Kelley further added that he served as a scout in the in the 14th Missouri State Militia Volunteer Cavalry, Company G during the American Civil War. This cavalry later became the 8th Missouri State Militia Cavalry, where in Company L, he served as a blacksmith and a farrier. He also served in this capacity with Company I, Missouri Volunteers and was honorably discharged on April 12, 1865. William G. Kelley's parents were Benjamin H. Kelley and Rebecca S. Thorpe. It thus would seem that serving in the military was something of a tradition in the Kelley family, as William G.'s father Benjamin Herndon Kelley also served in the military; he served in the War of 1812. Records show Benjamin Kelley serving with in the 13 Regiment (Gray's) Kentucky Militia and four other sons of his also served in the army in one capacity or another. Benjamin H. Kelley's father was another Benjamin Kelley, and it was this ancestor that has been written more about in the history books. Accoring to the book A History of Kentucky Baptists From 1769 to 1883: "Benjamin Kelley was of Irish ex traction, and the name was originally written O'Kelley. His grandfather was the only child of Irish parents, and was born on the Ocean, as his parents were emigrating to America. In his teen years he was taken prisoner by indians, though later an old indian woman adopted him as a son and he stayed with the Indians for about 6 years. He was later able to escape with the help of his adoptive mother and was able to return to his family in Virginia. He became a Baptist preacher of strong persuasion, as well as a good English scholar, engaged in teaching for at or over 30 years and was minister to four churches, performing marriages in Ohio County and Daviess County in Kentucky. These amazing facts about the Kelley family were all found in the Find A Grave website and I immediately encoded the names of Poe's ancestors in a free genealogy software called Family Tree Builder. The reason I shifted to this software once again, as opposed to my preferred softwares as mentioned in a previous post, is that its latest version has dramatically improved and its SmartMatching feature allows one to be alerted of possible only family trees which may be similar to yours. So I was able to trace Poe's grandfather, Auther E. Kelley, back to his great-great-grandfather Rev. Benjamin Kelley. Only a few generations, but this was still more than anything else ever traced on FPJ's family before. And then, after encoding all the names of ancestors and relatives of Auther E. Kelley in the database I received several notifications on SmartMatching that there were similar family trees available on the Kelley's online. And after looking at these trees and verifying their relationship to the one I made I was given more than what I first set out to do: four more additional generations of the Kelley family tree. It would seem that the Reverend Benjamin Kelley's parents were John Kelley and Ann Margaret Rush. This couple made quite a headline back in the day when they were accused of living in adultery. Of course, it would soon be made clear that this accusation stemmed from the fact that the couple belonged to the Quaker group, who were being persecuted in the colony by the members of the Church of England. Despite their hardship, their relatives never abandonned them. Ann Margaret's family banded together and even paid their "security" or a sort of bail. The harassment against their family only ended four years later after they were required to pay 500 pounds of tobacco or 50 shillings. Had they been unable to pay that particular amount, the punishment according to law would have been 25 "lashes well laid on" her bare back. John Kelley's father, Edmund Kelley, and grandfather, John Kelley, were the first two American-born Kelleys in the United States. It was the first John Kelley's father, James O'Kelley, who first came to the United States. He and his wife Hannah George were both natives of County Clare, which is located in the Mid-West Region and is also part of the province of Munster in Ireland. Since they came to Virginia in the early 1600s they can then be considered as part of the waves of migrants from the Old World who braved the New World in search of a better life. On a personal level I enjoyed this exercise of tracing FPJ's family tree because I had once more proved another amazing resource in genealogical research: the use of the internet. I was able to begin FPJ's family tree through FamilySearch, which gave me three generations of Kelleys starting with his grandfather, A.E. Kelley. From FamilySearch I jumped to Find A Grave which gave me an additional two generations of the Kelleys. And, thanks to the vast collections of family trees in Family Tree Builder I was able to connect another four generations of the first Kelleys in the United States, ending with Ronald Allan "FPJ" Kelley Poe's great-great-great-great-great-great-great-great-grandfather, James O'Kelley, who was from Ireland. In hindsight, the detractors of FPJ who questioned his nationality were the ones who did not understand the concept of nationhood and love of country. FPJ's Spanish grandfather, Lorenzo Pou, could have returned to Spain after 1898 but instead he remained in the Philippines and died as a Filipino, as listed in his death certificate. On his mother's side, FPJ's American grandfather, Auther E. Kelley, could have returned to the United States after the US gave back our independence. Instead, he decided to remain in the country where he had served in the army since at least 1910. And if those detractors could have looked back into FPJ's American ancestry, they would have seen the amazing traits of his bygone ancestors: men and women who braved the unknown and harsh new world to start a new life, later becoming respectable ministers and founders of churches, and then much later fighting for their country in various wars throughout their nation's history. I was never much of an FPJ fan, finding much of his movies too cliche. But when one looks at the commonality of the themes of his films one finds a surprisingly large amount of movies about justice; justice for the oppressed and the poor and the defenseless, so much so that the Filipino masses began to see him as a hero of the masses. Perhaps subconsciously he produced and starred in movies that showed him in ways that were very similar to the actions of his Kelley ancestors. Whatever what-ifs in history, Ronald Allan "FPJ" Kelley Poe certainly had an amazing family tree. And he led an equally amazing life that has definitely left a mark in the Filipino psyche. 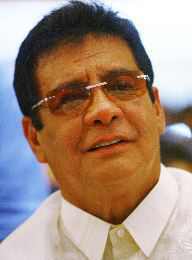 For a fuller family tree of Fernando Poe, click here.